A Republican senator already under fire for apparently racist remarks accepted a donation this week from an out-of-state white supremacist. Aerospace entrepreneur Peter Zieve — who gave $1 million to President Donald Trump’s campaign — donated the maximum $2,700 on Nov. 14 to U.S. Sen. Cindy Hyde-Smith (R-MS), reported the Jackson Free Press. Hyde-Smith, who was appointed in March to finish the term for retiring Thad Cochran, faces Democrat Mike Espy, who is black, in a Nov. 27 runoff election. The GOP senator faced widespread criticism for making a joke about attending a “public hanging,” which was seen as a reference to lynching, and then made another crack about making it “more difficult” for “liberal people” to vote. The Free Press asked Hyde-Smith’s communications director, Melissa Scallan, to comment on Zieve’s donation, but she asked to speak with the campaign’s finance department and had not responded nearly 18 hours later. Zieve, who was sued by the state of Washington in 2011 for refusing to hire Muslims at his company, Electroimpact, and made numerous comments against immigrants and non-white people, explained his donation to the newspaper. “I believe she’s a Republican,” Zieve said. 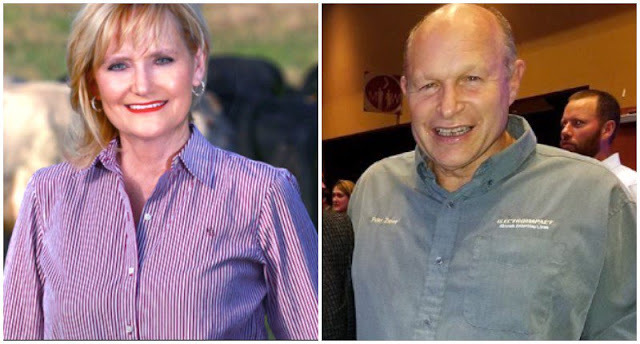 The reporter asked whether Hyde-Smith’s racist remarks prompted his donation, and he denied knowledge of the comments and quickly hung up the phone. The progressive newsletter Popular Info first reported Zieve’s donation, which came three days after blogger Lamar White published the video on the Bayou Brief. Zieve has also made references to the “14 words” slogan promoted by white nationalists and regularly makes comments about genocide against Muslims.